Most parenting books outright, or indirectly, promise a good outcome if you only follow their suggestions. 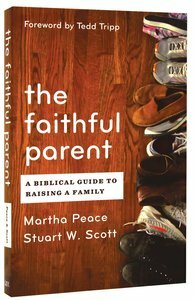 The Faithful Parent gives many practical, biblically-based suggestions but promises that the most important relationship in any family is vertical - between parents and God. It is the faithfulness of the Christian parent that glorifies God. It is the faithful parent who has the biggest impact on their children.